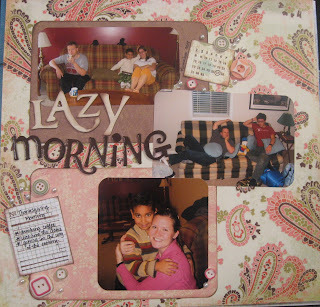 Here are a few scrapbook pages from previous years of Thanksgiving. I love this holiday and I'm so glad I've documented the past several years in my scrapbooks! 2009 was also the year of the Great Thanksgiving Blend hunt! We went to many, many Starbucks to stock up on our favorite Blend! And one more 2009 page...I'd like to make a page this year like this, documenting what I'm thankful for. In 2010, for the first time we did the cooking! James, Josie, Matt and I all pitched in! My main concern is that looking back, I have NO IDEA what we did for Thanksgiving in 2007 (our first year in Seattle.) I remember 2005 and 2006 and I don't have pictures for either year. I sure wish I were a crazy picture taker back then so I could remember every year! Love it! It's so fun to see the history in pictures! I think it was 2006 because I was already married!